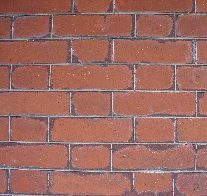 Loosely speaking, 'pointing' is the mortar between bricks. 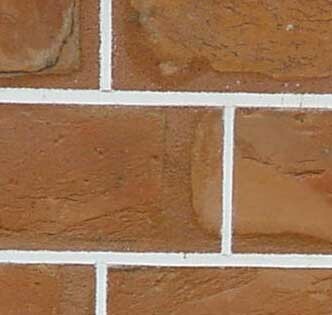 A more accurate definition is that it is the visible edge of the mortar-joint. The mortar is normally a mix of lime and sand, or from the 1920s cement and sand. A colouring is sometimes added. Black mortar uses crushed ash rather than sand. Most houses used, at best, the last of these, with flush or slightly recessed pointing. Styles of pointing included flush, tuck, bucket handle and recessed pointing. Weatherstruck pointing was never used. The two pictures below show an example of tuck pointing. 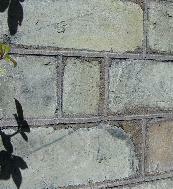 You can see how the bricks are pointed with a stained mortar and then a line of putty mortar set in. The white putty is a mix of silver sand and lime. 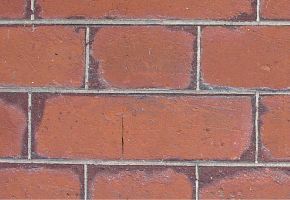 Tuck pointing was used to disguise poor quality, chipped and irregular bricks. 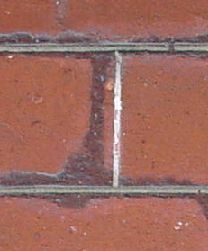 Lines are put on the surface to align the verticals from the footings to the top of the building; the putty was added from the top downwards but if the brick courses are not aligned, the tuck-pointing needs to match. 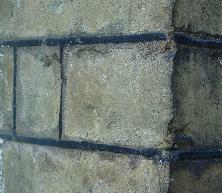 The stopping was 'wiped' over the bedding mortar while it was still 'green'.